Do you know what an Earthworks Contractor does? Civil Earthworks is more than simply removing soil and material from one place and relocating it to landfill or a holding yard. There are many other important tasks to be expected of a civil Earthworks Contractor. Site preparation, grading, levelling, trenching and excavating are all part of the package and are integral to the whole site construction, so usually Earthworks Contractors are highly sought after. Make sure your site is in the right hands by talking to the team at Stoney Pinch about the Earthworks services we have on offer, including all the important responsibilities below. Whether you are looking for career ideas or are looking for a new Earthworks contractor, read on for what a day in the life of Stoney Pinch might include. On any given construction site, once the surveyors have determined the boundaries of the property and the architects and designers are done with determining the site specifics, Earthworks contractors like Stoney Pinch, come in and start to remove the top layer of soil and continue on to the depth required for the building foundations. It is also part of our service to carry out compaction testing using specialised equipment and highly trained team members to confirm the soil is firm enough for its intended purpose. No one wants a building to shift. We also do the same for civil projects like bridges and roadways and have worked with the South Australian government on a number of occasions completing projects to better the infrastructure for Adelaide and surrounding areas. Some Earthworks contractors work as subcontractors on larger projects under the supervision of a general contractor or project manager. Stoney Pinch can do this, however we can also manage projects and perform the role of general contractor. Possibly the biggest responsibility of an Earthworks contractor is actually moving the soil and to do this we need heavy machinery and plant. The use of heavy equipment like trenchers and backhoes as well as bulldozers and compactors is expected in just about every project. The integral piece of plant equipment used by Earthworks Contractors though, has to be the dump truck. As Adelaide’s premier Earthworks Contractors we can also store the soil, if it needs to be reused or relocate it according to environmental guidelines. Most commonly you will see contractors who have hired the trucks and drivers and the equipment to move the soil. Stoney Pinch have their own equipment, this is so we can assure our clients that the machinery used is well maintained and available when they need it; not subject to other projects returning the equipment on time. The equipment needed on site can be quite costly and some contractors will simply hire the equipment and pass that cost onto their client, Stoney Pinch own the equipment so whilst our initial costs were high, we saw the benefit both to our team and to our clients to own and insure the equipment directly. It’s also important to remember as Earthworks and heavy machinery contractors we need to be appropriately trained and licenced and at Stoney Pinch we make sure our team are up to date on the latest education and training for our industry. 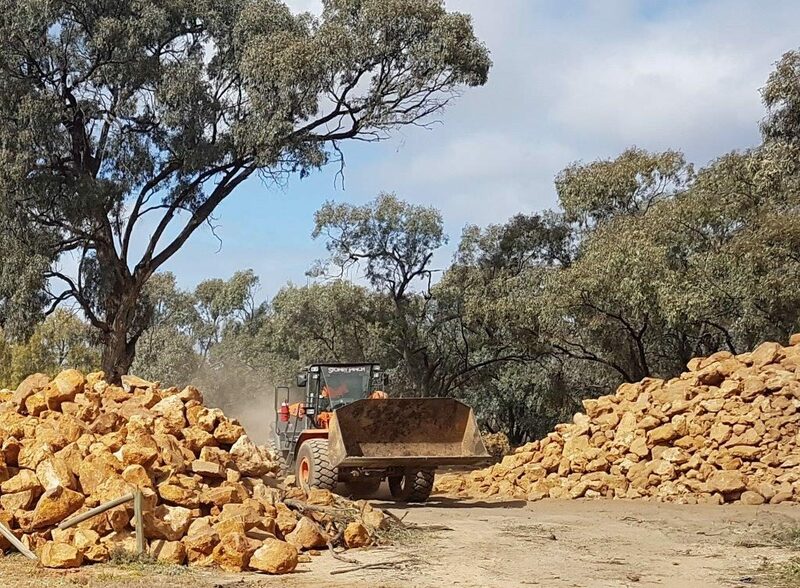 If you are looking for a qualified, safety conscious, committed Earthworks contractor team in the Adelaide and Riverland area or to seek a quote or tender, give our friendly Stoney Pinch team a call on 08 8586 5990.